Top quality stainless steel vacuum food jar choice for people on the go, the Stainless Steel Vacuum Insulated Food Jar is built to last and loaded with features to make for a more enjoyable eating experience. Fijoo vacuum insulation technology virtually eliminates temperature change within the food container by creating an airless space between two stainless steel walls and a added copper wall. The result is an insulation layer that advances and performs better than any other. A superior insulated container you can depend on to keep your food hotter, colder, fresher, longer. This food jar keeps items hot or cold for hours, making it a great choice for long days where mealtimes might be a little irregular. Constructed with triple wall stainless steel and copper, Fijoo 27 ounce food jar is virtually durable, yet its sleek design is both eye-catching and functional making it perfect to take anywhere on the go. Triple wall vacuum insulation technology keeps the food item, drink hot/cold for hours; the no sweat exterior keeps the outer body dry and cool, eliminating the need for a coaster. The silicone ring attached to the jar provides a firm hold with a strong grip. A Free Folding stainless steel spoon comes with the pack for ease of use. Better thermal insulation – easy to keep hot food hot & cold food cold for way longer now. Easy-to-fill wide mouth of the jar provides a hassle-free use of it; easy to clean with warm water and soap. In order to maximize the incredible insulation technology, we recommended you to either pre-chill or pre-heat the food jar just prior to use. This can be accomplished by filling the food jar with hot or cold water, tighten the lid. DURABLE INTERIOR & EXTERIOR: Superior quality Fijoo Food Jar made of 18/8 premium quility stainless steel with an added triple wall copper vacuum insulation technology, helps maintain desirable temperature of hot/cold food for extended hours, leak-proof design, and comes in generous 27oz capacity to help carry sufficient soup or food. 100% BPA Free Food Grade stainless steel material more safer than plastic material, and more durable. 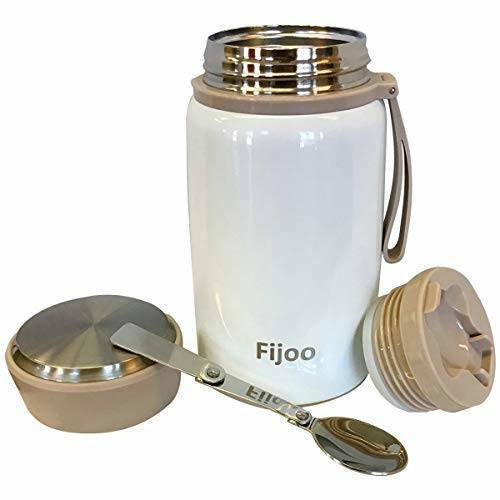 INCREDIBLE QUALITY: Fijoo vacuum food jar is not only super-safe for your family but also looks premium & classy, encouraging you to carry home-made food. Extra wide mouth is easy to fill, serve from and clean. Wide Opening offers unparalleled convenience of filling, eating from & cleaning the food flask, flexible handle ensures ease of carrying around, twist-to-open hassle-free opening. Addition of folding spoon on lid helps you server or eat your hot soup easily. MULTIPURPOSE VERSATILE FOOD JAR: Whether you want to take pasta to the work, pack hot soup for your kids lunch break at school, carry some custard for a picnic, day outing, sports or any other outdoor activity, Fijoo Vacuum Insulated Food Jar proves handy & eliminates the need to use Microwave for reheating – thus offering you a smarter choice for a healthier lifestyle. BEST IN CLASS UNBEATABLE DEAL – The easy to carry FOLDABLE SPOON & FEXLIBLE HANDLE included with each hot food thermos make life a lot easier for you. Triple wall vacuum insulation for maximum temperature retention with extra wall of copper keeps hot or cold for longer duration. Easy to carry handle and Ergonomically designed stainless steel top lid prevents from damage to lid. Cool to the touch with hot liquids, sweat proof with cold. Product stays hot. I use this for my lunch. My soup is just at hot at noon as it was when I put it in at 7 am. I love this. I haven’t used it for cold stuff yet but I am confident it will keep cold. Efficient, Convenient, and Durable. Over the years I have purchased many brands of wide mouth thermos bottles. Very few were dependable, or efficient……regardless of the price. My recent purchase of the Fijoo thermos changed everything. It is the finest hot (or cold) food thermos I have ever bought. It has kept soup and chilli surprisingly hot, and enjoyable, for hours. I am now ordering one for my wife. The folding spoon is a really nice touch, as well as being sturdy. It locks, securely, inside the lid.